It’s silly season – well, the sales season, actually – and consumers are out there spending like crazy. At the same time, Envol Vert is able to announce that its Forest Footprint awareness-raising tool was used by 40,000 French people in 2015! These figures prove that the public are genuinely interested in the link between the goods we use every day and the forest. They also show that forest-friendly consumer habits are developing but that they are not yet widespread across France or applied to all goods. Today, Envol Vert is launching a European Version of its Forest Footprint that includes additional drivers of deforestation such as beef and rubber. Try it out and see how you can protect our precious forests! In 2015, the figures on deforestation pointed to increases in many countries such as Burma, Peru and some parts of Africa, and the situation was still of great concern in Indonesia and Brazil. The year was also marked by some good news with new Zero Deforestation commitments announced by some big businesses  . However, certain companies – especially in the finance sector – still remain silent on the issue. French consumers also appear to be very interested in understanding the link between deforestation, commodities and their consumption of everyday goods. In fact, no fewer than 40,000 people measured their Forest Footprint in 2015! People who are environmentally-aware enough to measure their Forest Footprint consume fewer products associated with deforestation, such as meat, paper and tropical wood, than the French average. However, their consumption of eggs, dairy products and tea or coffee is on a par with the national average. These latter goods have a more indirect link with deforestation (through soy used in animal feed, for example) or are given less media coverage and the French are thus much less aware of their impact. There is good news for the third of product categories where the French consume more forest-friendly goods (certified responsible goods, locally produced or recycled goods, etc.). A closer look at these results highlights some clear differences between the French regions. In southeast France, animal protein consumption is lower, as is the case for tropical wood and electronic devices, and there is also a tendency to avoid processed goods containing palm oil. However, in southwestern France, consumption of meat products, which involve soy from Latin America, is much higher. That region’s inhabitants are also France’s biggest car users, meaning the southwest has the worst overall Forest Footprint in the country. Now everyone in Europe can measure their Forest Footprint! Europe is the world’s biggest consumer of commodities that contribute to deforestation and, according to Forest Trends, some of these products actually come from illegal sources, for example beef imported into the UK, soy in France, leather in Italy, and palm oil in the Netherlands. In addition, recent studies show a 70% increase in natural rubber consumption by the tyre sector, which could lead to new areas of deforestation if rubber plantations do not adopt more sustainable practices. Envol Vert has decided to expand its tool to include beef and rubber. 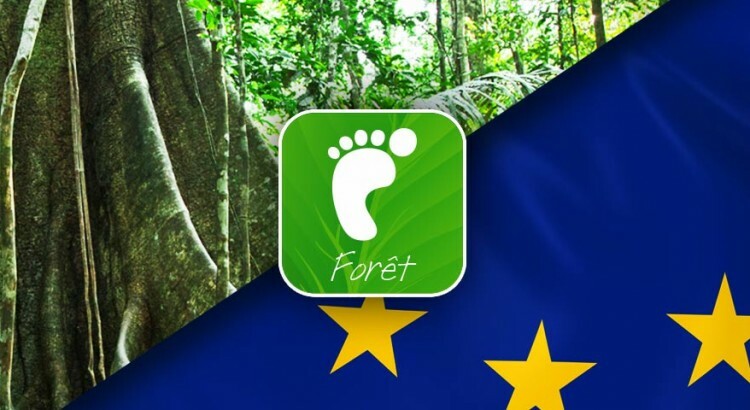 In addition, Envol vert has translated the Forest Footprint into Spanish and English so that more European citizens can find out their impact on the forests and thereby develop awareness. To coincide with the launch of the Europe-wide tool, Envol Vert is asking Europe, as a signatory of the United Nations New York declaration , to put an immediate end to all imports that lead to illegal deforestation and to make sure that consumers are informed about the risks of deforestation, such as the impact on biodiversity, associated with the goods they consume. –“The forest helps us, so let’s help it!” – invites companies and individuals to commit to this noble cause. Forest footprint : What is the Forest Footprint?